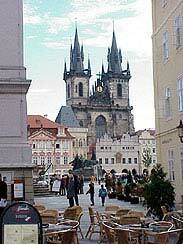 It is said that everyone who sets foot in Prague falls in love with the city. Prague is characterized by its many architectural treasures: apart from the Romanesque rotundas and the basilica of St. George there are a multitude of buildings dating back to the Gothic area, among them the jewel of Prague, the Charles bridge, as well as many Renaissance and Baroque palaces. The monumental Baroque facades of the Clementinum boarding school or the Church of St. Nicholas are reminders of the Counter-Reformation and re-catholicization of Prague. The 19th century with its Empire and Neorenaissance buildings is also much in evidence. The Rudolphinum, the house of artists, the National Theatre and the National Museum are typical examples of the Bohemian school of the era. The Prague art nouveau style and modern cubist architecture from the early twentieth century also occupy an important place. 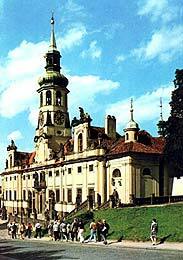 The original seat of the Czech princes and kings became a presidential residence in 1918. Some of the buildings are open to the public, among them the Old Royal Palace, St. Vitus´ Cathedral, St. Wenceslas´ (Vaclav´s) and St. Vojtech´s Chapels, St. George's (Jiri´s) Basilica and Cloister, the Lobkowitz Palace and the Golden Street. The Royal Garden together with the Micovna, the South Gardens, the Deer Moat (Jeleni prikop), the Picture Gallery of Prague Castle and Queen Anne's Summer House are open in the summer season. The Charles Bridge ranks among the most significant tourist sights of the city. 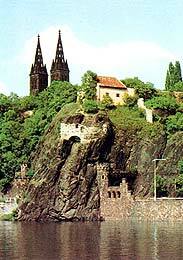 It was founded by Charles IV in 1357 and completed in 1402. It was designed by the architect Petr Parler. The Bridge, which is 516 meters long cointains16 pillars and 3 bridge towers. One of them, the Old Town Bridge Tower is considered to be the most beautiful bridge tower in Europe due to its rich sculpture decoration. Thirty sculptures, which decorate the Bridge, date mainly from the baroque period - from the 18th century. The most valuable ones were created by Matyas Braun and E. M. Brokoff. This area includes the Old Town Hall with an Astronomical Clock. The Town Hall was founded in 1338 while the Astronomical Clock dates from 1410. Twelve apostles appear every hour in its upper part. Historic rooms of the Town Hall, a tower and a Gothic chapel are open to the public. This Gothic structure, which dates from the 13th century, is the most significant sight of the Prague Ghetto. The Old Jewish Cemetery, which includes Gothic, Renaissance and baroque tombstones, is located nearby as well as other synagogues. They belong to the exhibition of the Jewish Museum. This ranks among the most significant pilgrimages of the Christian world. The Prague Loreta was built in the baroque style in 1626 - 1750. The famous chime, which contains 30 Loreta hand bells, is located in the tower and plays Our Lady's song "We greet You thousand times". The Loreta treasure, which includes the most valuable diamond monstrance (it is decorated with 6222 pieces of diamonds), is the most attractive part of the exhibition. This preserved compact town area contains a number of Renaissance and Baroque churches, palaces, houses and park gardens. The complex of the Vallenstein Palace, where the residence of the CR senate is at present, the Church of St. Nicholas, which is decorated in baroque style and is also used for concerts, and the Church of Our Lady Victorious with a wax statue of the Prague Christ Child, are among the significant buildings of Mala Strana. This new-Renaissance construction, which was built by J.Zitek, arose from nation-wide financial collections in 1868-81. It was renovated after a fire in 1881-83. The National Theatre is one of the most beautiful examples of Czech architecture, which dates from the second half of the 19th century. It was decorated by almost all the important Czech artists living in that period. This Cloister, which was owned by the Premonstrates order, dates from 1140. Its area includes the Church of Our Lady of Ascension, the Strahovska Picture Gallery and a rare cloister library, which is located in large halls decorated with baroque ceiling frescos. This Gothic three-aisle structure contains the tombstone of the Danish astronomer Tycho de Brahe, who stayed in the residence of Emperor Rudolf II in Prague between the 16th and 17th century. This National Cultural Monument, which was once the residence of the Premyslides princes, is a famous tourist site. It provides beautiful lookouts to the city. The Romanesque St. Martin's Rotunda, together with casemates and the St. Peter and Paul's Church rank among the well-known preserved sights. It includes also the Slavin Cemetery, where a number of outstanding Czechs are buried. This baroque chateau, which includes a French garden, was built on the right bank of the Vltava River at the outskirts of the city in the 17th century. It was open to the public after an expensive re-construction. A collection from the Gallery of the Capital City Prague is located here. 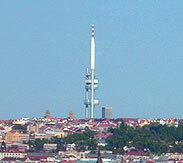 The Prague zoo is situated nearby. This marks a new dominant feature of the city in its southeast area. This tower with a height of 216 m is the highest construction in the city. It is open to the public and contains a look-out terrace and a restaurant. The Deer Moat, which is located near Prague Castle, was only recently opened to the public. You can enter it from Klarov or from the Powder Bridge. This monument is located in the center of the square and was created by Ladislav Saloun in 1915. The Valley of the Wild and Still Sarka (Divoka a Ticha Sarka), which is located in the western outskirts of the town, is a traditional destination of Prague inhabitants for a long time. The female name Sarka is linked to a romantic legend about a "Girls War". This site has inspired a number of artists. Mountaineers as well as tourists enjoy these romantic cliffs. A comfortable path goes along the whole Valley. Two open air swimming pools ("Dzban" and "Divoka Sarka") are located here. Other interesting nature formations are situated in the Prokopske and Dalejske Valley or in the Barrandov Rocks.